If you have bees in your house or another structure you will need an extraction specialist. Unless noted on the Swarm Contact list, the beekeepers many not be able to help you. There are other resources available. Please contact the site administrator for more information. Please read the following before calling one of the bee keepers on the Swarm Contact list. Please do not spray the bees with anything, especially insecticides or water. This can be dangerous to not only the bees, but to you and the people around you. Ensure you are dealing with honey bees and not another beneficial insect. Please visit Buzz About Bees dot net to identify the various bee types. Please note: our beekeepers are not pest control professionals. They are experienced with honey bees and can rescue them unless the bees are too high, in a wall, etc. We remove honeybees only. If you do locate a yellowjacket nest, in Napa County home owners can call the Napa County Mosquito Abatement District for (usually) same day service. Phone: (707) 553-9610 | Monday through Friday, 8:00 a.m. – 4:30 p.m. Hear a thunderous buzz outside your window? Notice a large dark cluster of insects suddenly hanging from a tree branch, fence, ladder, or woodpile in your backyard? These are swarming honey bees. Want to know what to do with them? Please, whatever you do, don’t kill them — many of our beekeepers would be glad to move them to a new home for you. Under ideal conditions, a strong, established honey bee colony will subdivide, and one or more swarms will leave the hive. It is their way of reproducing. 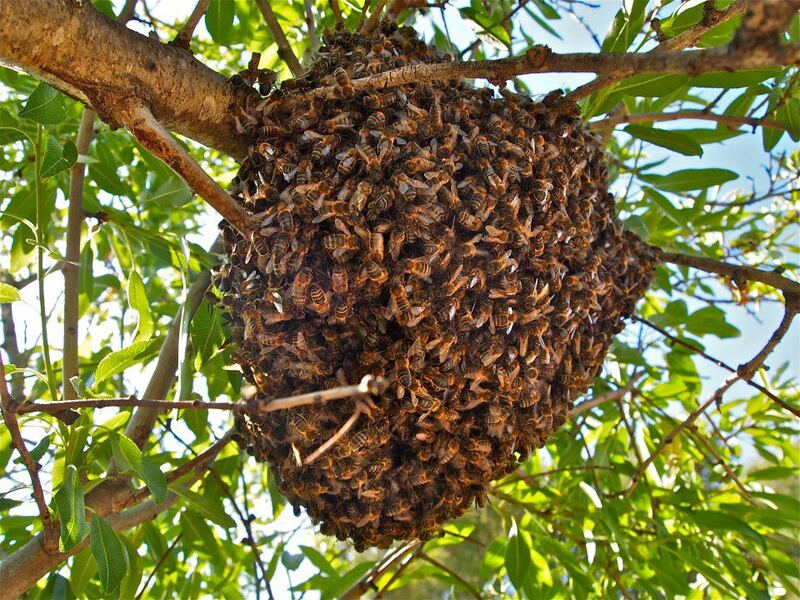 A swarm may cluster for a while on an exposed tree limb or bush near the old hive while scout bees search for a suitable place to establish a permanent new home. Folks often become concerned when they find swarms clustering in their yards. After all, it’s a lot of bees, and bees sting, right? Actually, honey bees most often exhibit defensive behavior near their nests, where they are concerned with protecting their young and food supply (honey!). A honey bee swarm has neither young nor food stores and isn’t likely to exhibit defensive behavior unless unduly provoked. Honey bees do not make a new entrance to a nest, they look for an existing entrance. Periodic inspection and caulking can prevent them from moving into your walls. If you ever had one nest in your house you have a better than 70% chance that bees will try and regain entrance. Why pass up a good nesting site. So make doubly sure the entrance is sealed! If honey bees have already built a nest in your walls, they can be removed with the assistance of a bee removal specialist . Pesticides don’t work — the left-behind comb attracts insects and rats, and the honey ferments and oozes through walls. Decaying bees and fermented honey smell terrible! A bee removal specialist will expose the colony, rescue the bees and relocate them to an apiary, and remove the honey and wax. The process takes several hours, and is chargeable. Plus you will have to fix the wall!